GS2 sends email updates approx. 2 times a week or based on urgency of action onboard. For ALL updates off the boat OR the latest update please visit the GS2 Facebook Page or the GS2 website respectively. Short cuts available at the right too. I think where I left off last was with the approaching gale and me in "yellow flag" mode, slowing to let the gale go past. So that strategy worked well and while I did see winds over 40k, I did not get the 70k winds that were not far away, so I felt good that between Commanders Weather and my weather/routing we devised a strategy that worked. So I passed the longitude of Cape Leeuwin, Australia, one of the "Great Capes" on Tuesday and have been humming along since then in very good conditions with North-Westerly winds in the 20's which allows me to sail on port gybe at a wind angle of about 130', which is perfect for this boat. The next milestone is getting past the longitude of the South East Cape of Tasmania, which is about 900 miles ahead. 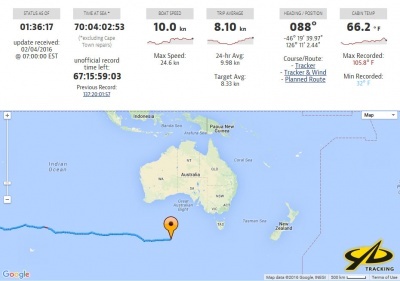 After that the target is Stewart Island at the Southern tip of New Zealand, which is about 1,750 miles, so I am targeting Feb. 12 or 13 as an ETA, at a 9 knot average boat speed and continued favorable wind direction. Good stuff. So I had a weird incident yesterday, as I was sitting in the cabin reading around mid-day my time, I picked up my iPhone to check text messages from the YB tracker system, and there was a message from my wife Kim asking if I was Ok as my EPIRB (Emergency Position Indicating Radio Beacon) had been triggered and sent a message to the world-wide sea-air rescue network and Kim had been contacted by both the US Coast Guard and the Australian Rescue Center to see if my EPIRB alert was real or a false alarm. Holy Cow- I had no idea... so I crawled to the back of the boat to a locker in the port stern quarter and found my "ditch bag" of emergency supplies, which had one of my EPIRB's in a front pocket. The bag had somehow been flipped over and was upside down, causing the EPIRB to be pressed into the floor, which accidentally pushed the "ON" button and the EPIRB was flashing and transmitting an emergency signal of distress. So I flipped the bag back over and pushed and held the "on" button on the EPIRB, which de-activated the signal. However, the signal had been transmitting for about 90 minutes already, so Kim had been called by the U.S. Coast Guard at 3:00 AM, asking if she knew me and if I was really in distress? Since we had been emailing only a couple of hours ago and the tracker showed the boat moving in the right direction at 10 knots, Kim told them she thought I was OK but would check and get back to them. She then called and emailed a team of 6 experienced mariners I had put together before my departure to handle "emergency communications", and all waited to hear back from me. I was shocked to get the message that the EPIRB was on, so quickly relayed to Kim that there was no emergency- everything was fine on board GS2- and to please tell the U.S. and Australian sea-air rescue teams to stand down. I then called Kim on my sat phone which had not been functioning well, but I took the Iridium phone out of its cradle and brought it on deck and- lo and behold- it got a signal and connected the call! Kim was obviously relieved to hear that everything was OK and this was a false alarm, but it was 3:00 in the morning and she had been dealing with this for two hours and she was understandably a bit stressed! Luckily our Emergency Comms team had responded- the world-wide COSPAS-SARSAT sea air rescue system that the EPIRB alert triggers had responded rapidly and efficiently and everyone was ready to assist- which was awesome. So on we go- I feel badly for the accidental triggering of the EPIRB (it is now in a "Pelican" waterproof case with lots of padding) and the stress it placed on Kim and my team as well as the international sea-air rescue system, but the good news was that everything worked as it was supposed to, which gives me confidence that were I to have a real emergency, the people, systems and technology are in place to effect a rescue. Thank you to all involved. More news in a few days... hopefully it will be boring… and Happy Birthday to my Mom, Katrina Parson- who turns 79 today!